Vada [vəɽɑː] (vaḍā) is a category of savoury fried snacks from India. Different types of vadas can be described variously as fritters, cutlets, doughnuts, or dumplings. Alternative names for this food include wada, vade, vadai, wadeh and bara. The various types of vadas are made from different ingredients, ranging from legumes (such as medu vada of South India) to potatoes (such as batata vada of West India). They are often served as a breakfast item or a snack, and also used in other food preparations (such as dahi vada and vada pav). According to K. T. Achaya, Vadai (Vada) was popular among ancient Tamils during 100 BCE-300 CE. A type of vada is mentioned as "vataka" in Manasollasa, a 12th-century Sanskrit encyclopedia compiled by Someshvara III, who ruled from present-day Karnataka. In this recipe, green beans are soaked, de-skinned, and ground to a paste. The paste is shaped into balls and deep-fried. Early literature from present-day Bihar and Uttar Pradesh also mentions bara (vada) and mungaura (a vada made from mung). Vadai (Vada) may be made from legumes, sago or potatoes. Commonly used legumes include pigeon pea, chickpea, black gram and green gram. Vegetables and other ingredients are added to improve taste and nutritive value. For legume-based vadas, the legumes (dal) are soaked with water, and then ground to a batter. The batter is then seasoned with other ingredients, such as cumin seeds, onion, curry leaves (sometimes previously sauteed), salt, chillies or black pepper grains. Often ginger and baking soda are added to the seasoning in shops to increase the fluffy texture and improve fermentation for large batches. 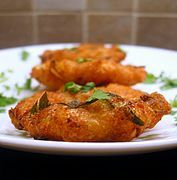 The mixture is then shaped and deep-fried, resulting in vadas with a crispy skin and fluffy centre. The preparation of kalmi vadas involves cutting the resulting product into pieces and re-frying them. Vadas are often eaten as snacks or as an accompaniment to another dish. In restaurants, they can be ordered as an à la carte item, but are not the main course. They are preferably eaten freshly fried, while still hot and crunchy. They are served with a variety of dips including sambar, watery or dry chutneys and dahi (yogurt, often called "curd" in Indian English). Medu vadas are typically served along with a main course such as dosa, idli, or pongal. Sambar and coconut chutneys are the standard accompaniments for medu vadas. Medu vada, made with urad dal (black gram) flour. This vada is shaped like a doughnut with a hole in the middle (i.e. an approximate torus). It is the most common vada type throughout South India and the most recognisable throughout India. It is also known as ulundhu vadai, uddina vade, minapa vada (Telugu) and uzhunnu vada. Masala vada, made with toor dal (whole lentils) and shaped roughly like a flying saucer. It is also referred to as aamai vadai in Tamil due to its resemblance to a tortoise. Other names include paruppu vadai (Tamil), masala vade (Kannada), masala vada and parippu vada (Malayalam). Maddur vade, a type of onion vada unique to the state of Karnataka. It is very popular in the Maddur town of Karnataka and has a very different taste from any other vada types. It is typically larger than other vada types and is flat, crispy (to the point of breaking when flexed) without a hole in the middle. It originally started as a snack at the Maddur railway station on the Bengaluru - Mysuru railway line. Maddur was the halfway mark on this line and most trains would stop there with passengers buying this tasty snack. Ambode, made from "split chickpeas without the seed coat" i.e. kadale bele in Kannada. Mosaru Vade, made by cooking a vada normally, and then serving the vada in a mix of dahi (yogurt) and spices. Eerulli bajji, also known as uli vada (Malayalam): made with onion. It is roughly round-shaped, and may or may not have a hole in the middle. Rava vada, made of semolina. Bonda, made with potatoes, garlic and spices coated with lentil paste and fried. In some regions, a bonda is considered a distinct snack food, and is not held to be a type of vada. Sabudana vada is another variety of vada popular in Maharashtra, made from pearl sago. Thavala vada, a vada made with different types of lentils. Keerai vada (spinach vada) is made with spinach-type leaf vegetables along with lentils. Batata vada (potato vada). Often served in the form of vada pav, with a bun (known as a pav) and chutney; a common street food in Maharashtra, especially in Mumbai. Keema vada, a vada made from minced meat, typically smaller and more crisp than other vada types with no hole in the middle. ^ Andrea Nguyen (2011). Asian Dumplings. Ten Speed Press. p. 3. ISBN 9781607740926. ^ V. K. Joshi, ed. (2016). Indigenous Fermented Foods of South Asia. CRC Press. p. 401. ISBN 9781439887905. ^ "The Hindu : Sci Tech / Speaking Of Science : Changes in the Indian menu over the ages". hinduonnet.com. Retrieved 26 July 2015. ^ Pat Chapman (2009). India Food and Cooking: The Ultimate Book on Indian Cuisine. New Holland Publishers. p. 21. ISBN 978-1-84537-619-2. ^ K.T. Achaya (2003). The Story of Our Food. Universities Press. pp. 84–85. ISBN 978-81-7371-293-7. ^ a b Usha Raina; et al., eds. (2001). Basic Food Preparation (3rd ed.). Orient Blackswan. pp. 294–295. ISBN 9788125023005. ^ "Calories in Saravana Bhavan Vada and Nutrition Facts". fatsecret.co.in. Retrieved 26 July 2015. Wikimedia Commons has media related to Vada (snack).